Natural disasters can be absolutely terrifying. Though weather organizations have made advancements in predicting when earthquakes, tornadoes, storms, and other natural disasters may occur, many individuals can be left helpless by these happenings. As is the case in life, a freak occurrence can be both positive and negative in nature. There’s really no preparing for something out of one’s control — particularly when it comes as a massive surprise. Southeast Asia is known for having very extreme weather. Whether it’s immense humidity, scorching heat, or heavy rains, people from this part of the world are introduced to very wild conditions. Simply put, Mother Nature doesn’t abide by any rules. The early part of June generally coincides with the beginning of Monsoon season in Southeast Asia. Rural parts of countries are impacted far more than major cities. This is largely due to the lack of infrastructure and sound construction in small agrarian hamlets. When buckets upon buckets of rain falls upon the tropical setting, people run for cover in order to seek safety. Flooding is a serious issue, and the lack of resources made available in more rural areas can be a real danger when trying to deal with the rain. 25-year-old Ekkapol Chantawong is the head coach of a youth soccer team. With children aged 11-to-16, Chantawong works tirelessly to make the group of youngsters the best soccer players possible. 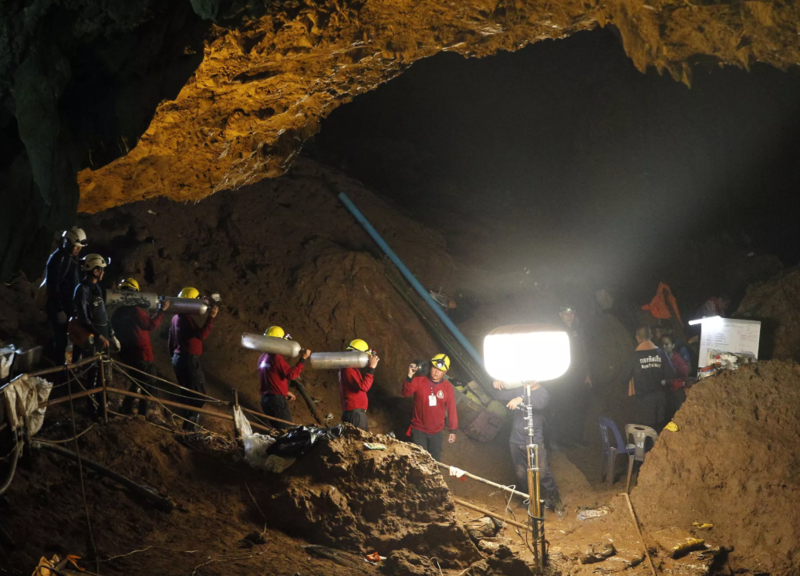 Located closely to the practice field is Tham Luang Cave — a brilliant underground labyrinth in a mountainous region in Thailand. A five-hour hike with the soccer coach and his players turned into a scary rescue mission. As has been the case with others in Thailand, a real natural disaster left the group of 13 in a very dangerous position. One would think this would be a made-up story in a book or even on television. Instead, this true life situation is hard to believe. It’s become a story garnering headlines all over the world. No one could ever believe how this all ended.